The United State’s intervention in the Yom Kippur War led to a 1973 oil embargo by the Organization of the Petroleum Exporting Countries (OPEC). The Yom Kippur War was an extension of the larger Arab-Israeli Conflict that dated to the late 1800s, when European Jews began to immigrate to Palestine. Tensions between the newcomers and the native Arabs first came to a head after World War II, when Palestine was partitioned to create the new state of Israel. The Yom Kippur War was the fourth of five full-scale wars caused by this conflict. It began on October 6, 1973, the Jewish holiday of Yom Kippur, when both Egypt and Syria staged a surprise attack on Israel. The United States provided the Israeli military with supplies for the war, which prompted the Arab-led OPEC to place a strict embargo on oil exports to the U.S. and other Israel-supporting nations. The embargo quadrupled the cost of oil and led to a shortage and rationing. This December 1973 photograph shows a common sight during the embargo–a station that ran out of gasoline. The embargo lasted until March 1974. A similar shortage and price increase occurred five years later, when the Iranian Revolution decreased oil production in the Middle East. Early gas stations were designed to be both beautiful and functional. 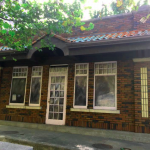 This early Atlantic station on Fortieth and Walnut Streets was modeled after a Greek temple. Esso stations provided African American motorists with gasoline, repair, and restroom facilities during the 1930s. 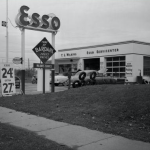 Esso was one of the few companies of the age that did not discriminate based on race. Gas stations expanded their business to provide motorists with other services during the Great Depression, including repairs and sales of automotive batteries and tires. 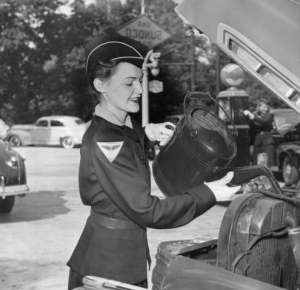 This 1941 photograph shows a Sunoco attendant filling an automobile radiator with fluid. The widespread adoption of the passenger automobile during the twentieth century altered the physical landscape of Greater Philadelphia and the United States. By the late 1910s, gas stations began to serve Philadelphia drivers seeking fuel for occupational and recreational travel. Since consumers could not visually determine the quality of gasoline, petroleum companies distinguished themselves from their competitors by designing gas stations with logos, color schemes, and architectural styles that proliferated along the region’s streets and highways. Purchasing gasoline was initially a messy and cumbersome process. Consumers bought gasoline by the bucketful from local garages, hardware stores, or groceries and filled their cars by hand with a measuring can. Sylvanus F. Bowser (1854-1938), an Indiana businessman, invented the Self-Measuring Gasoline Storage Pump in 1905. Consumers inserted a hose from Bower’s contraption into their gas tanks and manually pumped gasoline stored in nearby tanks. Nicknamed “filling stations,” gasoline pumps originally lined public streets, but motorists blocked the flow of traffic each time they stopped to refuel. 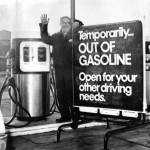 Off-street service stations with multiple gas pumps allowed petroleum manufacturers to distribute gasoline more safely. Atlantic Refining Company and Gulf Refining Company opened Philadelphia’s earliest gasoline stations during the late 1910s. Atlantic hired Pittsburgh architect Joseph F. Kuntz (1866-1938) to construct functional yet architecturally sophisticated stations. 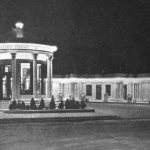 Kuntz modeled one Atlantic station located at Fortieth and Walnut Streets after a Classical Greek temple with columns, white terra cotta tiles, and nighttime lighting. Easily built and inexpensive prefabricated stations replaced the monumental architecture of the city’s initial gas stations during the 1920s. Gasoline manufacturers erected stations that mirrored the cottages and houses located in residential neighborhoods. 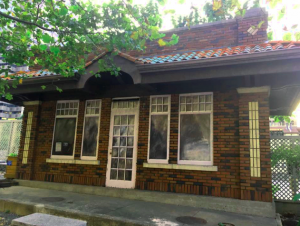 For example, Gulf Oil opened a brick, Spanish Revival gas station at Twentieth and Arch Streets in 1930. Gas stations expanded their range of services during the Great Depression by selling tires, batteries, and other automotive products as well as offering repair services to drivers. Despite the proliferation of gas stations, travel remained a stressful experience for African American motorists, who faced discrimination when they attempted to patronize roadside businesses. This was not the case, however, at gas stations of the Esso brand marketed by Standard Oil of New Jersey (later part of Exxon Corporation) to residents of Pennsylvania, New Jersey, Delaware, and New York during the 1930s. 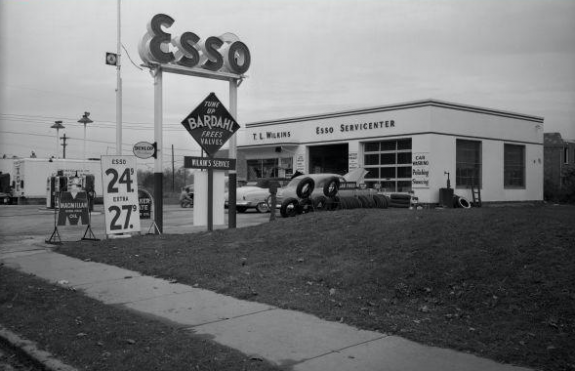 Esso was one of the only gas station chains that openly welcomed African American motorists, who sought out Esso stations for guaranteed service and access to facilities, such as restrooms. Philadelphia service stations owners struggled to supply gas to their customers during World War II. The federal government initiated a national gasoline rationing program in order to conserve gasoline and rubber in December 1942. Philadelphia residents received gasoline coupons based on their driving needs. Priority users, such as doctors, defense workers, and truck drivers, were allotted supplementary gasoline stipends throughout the war. 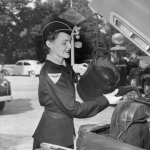 As American men joined the nation’s military efforts overseas, female Philadelphians took over key roles as garage attendants at the Atlantic Refining Company’s Point Breeze petroleum facility as well as local gas stations. Following World War II, as Americans purchased automobiles in unprecedented numbers and moved into single-family suburban homes, new service stations provided commuters with convenient places to refuel on the Schuylkill Expressway, at the Pennsylvania Turnpike interchange at King of Prussia (Valley Forge), in the Main Line suburbs, and in downtown Philadelphia. With the expansion of suburban shopping centers, such as Cherry Hill Mall in New Jersey, gas stations proliferated along access roads and highways during the 1960s. 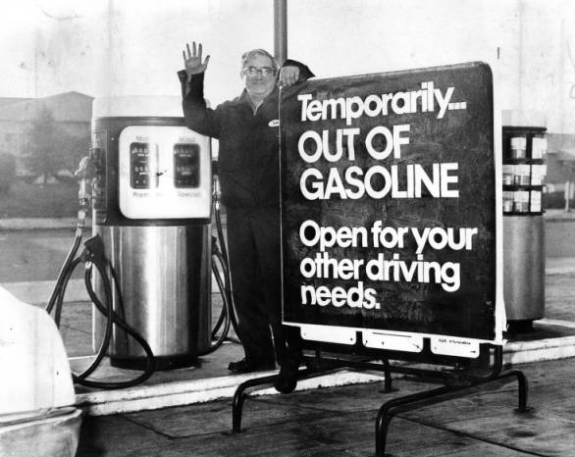 In order to save consumers money, most states moved towards self-service pumps by the 1960s, but not New Jersey, which adhered to its Retail Gasoline Dispensing Safety Act, enacted in 1949. Garden State residents remained opposed to self-service pumps and celebrated full service gasoline stations as an unusual aspect of New Jersey’s automobile culture. In 2016, New Jersey remained one of only two states (the other being Oregon) that continued to prohibit self-service pumps. During persistent gasoline shortages in the 1970s, gas stations became the scene of long lines of motorists waiting to purchase gasoline. After the Organization of the Petroleum Exporting Countries (OPEC) imposed an oil embargo on the United States in 1973 in retaliation for the U.S. decision to aid Israel in the Yom Kippur War, the price of oil per barrel within the United States quadrupled. Left with insufficient supplies of gasoline to meet motorists’ needs, stations posted signs to inform customers they were out of fuel. By the late 1970s, independent and budget-friendly gas stations challenged brand-name gasoline chains throughout the Greater Philadelphia region. Price-conscious motorists increasingly patronized independents, such as Bi-Lo and Skat, because of their lower-priced fuel. Gas stations including the Kocolene brand kept prices low by cutting out repair services. 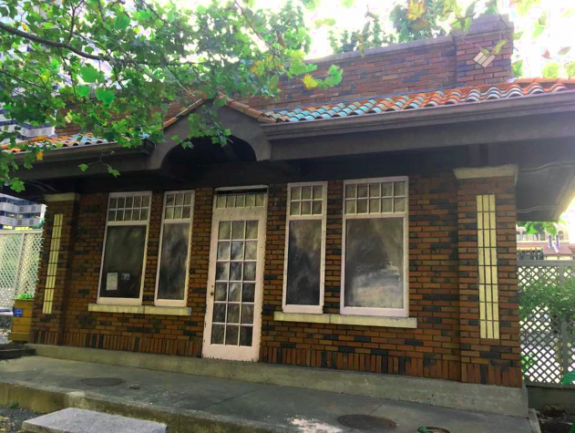 The growing popularity of off-brand and self-service gas station again altered station design. Gas stations adopted large canopies over their gas pumps to provide customers with quick service and protect them from the weather. Gas stations also constructed rectangular buildings offering grab-and-go food and beverages. Small convenience stores, like Sunoco’s Aplus chain, became popular gas station staples by the 1980s and 1990s. Along expressways and highways, full-service travel plazas proliferated, offering motorists brand-named gasoline as well as refreshments from chain eateries, such as Dunkin’ Donuts, Burger King, and Dairy Queen. Into the twenty-first century, gas station design and services continued to evolve to meet motorists’ changing tastes and needs. Alison Kreitzer is a Ph.D. candidate in the History of American Civilization at the University of Delaware. She is writing a dissertation about dirt track automobile racing in the mid-Atlantic region. Jakle, John A. and Keith A. Schulle. The Gas Station in America. Baltimore: Johns Hopkins University Press, 1994. Lingeman, Richard R. Don’t You Know There’s A War On? The American Home Front, 1941-1945. New York: G. P. Putnam’s Sons, 1970. Margolies, John. Pump and Circumstance: Glory Days of the Gas Station. Boston: Bulfinch Press Book, 1993. Schulle, Keith A. 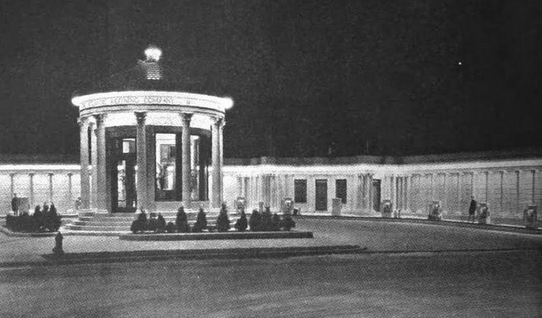 “Atlantic Refining Company’s Monumental Service Stations in Philadelphia, 1917-1919.” Journal of American Contemporary Cultures, Vol. 23, Issue 2 (Summer 2000): 39-52. Vieryra, Daniel L. “Fill ‘Er Up”: An Architectural History of America’s Gas Stations. New York: Macmillan Publishing Co., Inc., 1979. Gas Stations, Images, Urban Archives, Samuel L. Paley Library, Temple University 1210 Polett Walk, Philadelphia. Gas Stations, Collection and Images, Hagley Museum and Library, 200 Hagley Road, Wilmington, Del. Antique Automobile Club of America Museum, 161 Museum Drive, Hershey, Pa.
Simeone Foundation Automotive Museum, 6825 Norwitch Drive, Philadelphia. Pure Oil “Cottage Style” Gas Station (closed), 4431 Lancaster Avenue, Philadelphia. Five Points Shell Gas Station, 7011 New Falls Road, Levittown, Pa.